PLJV’s 2018 annual report is now available, and we’d like to thank all of our partners! 2018 marked a great year of accomplishments for the Joint Venture and demonstrated our effectiveness as a partnership-driven organization. 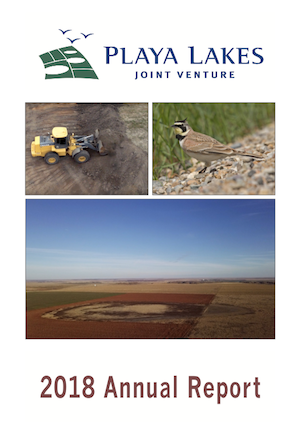 In addition to developing new tools for the benefit of our partnership and regional communities, such as the Kansas Water Map, we saw success on a range of conservation projects from the continued growth of our Playa Conservation Initiative in Texas to the wildly popular Migratory Bird, Butterfly, and Pollinator SAFE in Kansas and Nebraska. Overall, we influenced the conservation of 149,000 acres of habitat, leveraging over $23 million from federal and non-federal resources. We want to especially thank the US Fish and Wildlife Service Southwest Region who provides over half of our funding through the Migratory Bird Program. Those funds support the Joint Venture’s operations and contribute to the partnership’s many accomplishments, some of which are highlighted in this report. If you’d like printed copies of the report, please call us at 303-926-0777.